Aug. 21-22. After our 7-hour tour into Denali on August 20, we returned to a hotel complex about six miles south of the Park where, the tour originated. That’s because its main customers are from the big cruise lines, like Holland America and Princess Cruises and they operate hotels just outside the park for their tour customers. But as we attempted to start our car at about 4:00 PM, it just wouldn’t go. It would “catch” and run for a 10 seconds, then die. Then it wouldn’t start at all after trying 20 times. Our Ford Flex is only three years old with not that many miles on it, so this is a big surprise. The bigger problem is that we were nowhere near any competent auto repair services. Without dragging you through all the phone calls and difficult choice making, we were able to arrange a tow for both our car and trailer from Ford’s roadside assistance for the following morning (Sunday). We then got back to our trailer by using one of the bus shuttles and had a dinner and a much needed drink. 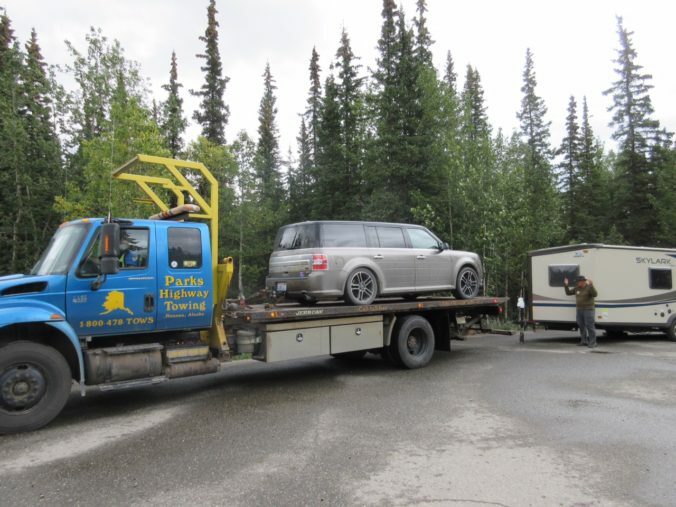 The closest towing company was in Nenana, about 75 miles away, so it didn’t arrive until 10:30 AM on Sunday. He first had to go where the car was to put it on the “tilt-bed” style tow truck he had. And because that truck was rather bit to get our trailer out of the camp site we were in, I borrowed the pickup truck of the “camp host” and pulled the trailer out to a larger parking lot where it would be easier to connect to his truck. The arrangement was to be towed to the nearest Ford dealer, which is in Fairbanks. That involved a 2 ½ hour drive, but there was room for both Cynthia and me in the truck and at least we would have our trailer at the RV site we had reserved and not have to rent a hotel, or return later to the Park to get the trailer.